Image: Rachel Farmer, Ancestors Traversing Quilts, 2017. Site-specific installation including ceramic, fabric, batting, and yarn. 77 x 258 x 20 in. Courtesy the artist. Photograph (c) Riya Lerner. 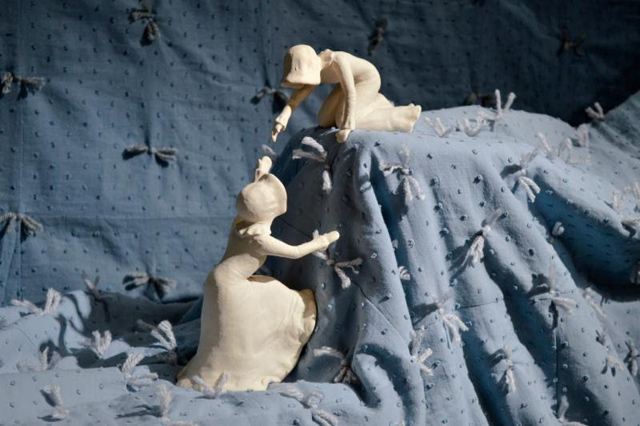 Please join us Thursday, July 27th from 6-8PM for the opening reception of Rachel Farmer’s instalation, ANCESTORS TRAVERSING QUILTS [at Leslie-Lohman Museum, New York]. During the reception our Director, Gonzalo Casals will give an informal talk about Farmer’s work and process before giving the stage to Farmer to answer any questions. This installation grew out of pouring over my great-great-grandfather’s diary chronicling his immigrant journey from England to Utah Territory in 1853­­­—while confronting the absence of information about my great-great-grandmother who made the same journey, as a single woman without family, in 1855.